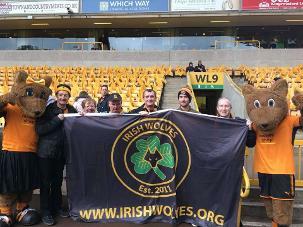 Welcome to the Irish Wolves Supporters Club website. 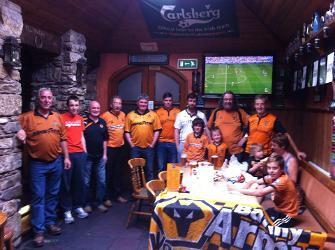 We are looking for fans of Wolverhampton Wanderers to join our Irish based W.W.F.C. 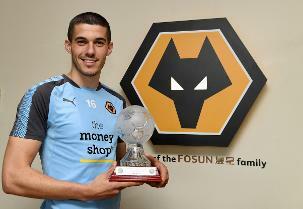 fan club which is recognised by Wolverhampton Wanderers. No matter where you are in Ireland, north, south, east or west, get in touch or look in our contacts section for your local supporter group contact. Before the Supporters Club parade at the final game of the 2017/ 18 season against Sheffield Wednesday. 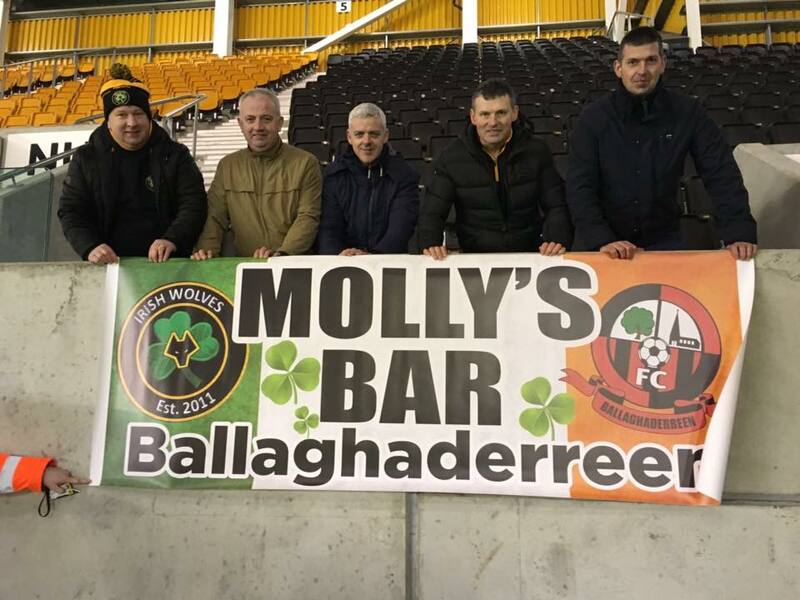 A group of Irish Wolves at the excellent win over Sheffield United in February 2018. Player of the year presentation to Matt Doherty 2015. Our next general meeting will take place on Saturday 23rd March in The Clarion/ Clayton Hotel in Cork City. Meeting starts at 2.00pm. Members and non-members welcome. Our next general meeting will take place on Saturday 17th November in The Chester, Antrim Road, Belfast. Meeting starts at 12.00pm. Open to everyone. Our next general meeting will take place on Saturday 13th October in Kavanaghs Bar, Portlaoise, Co. Laois. Meeting starts at 12.00pm. Several members attended the pre-season tournament in Switzerland. It was a great week meeting fellow Wolves supporters from all over Europe. Our next general meeting will take place on Saturday 24th March in Albert Lynch's Bar, Mallow, Co. Cork. Meeting starts at 1.30pm. We had a good representation of members at Molineux for the recent Nottingham Forest game. Disappointing result, but an enjoyable day otherwise. Next up is the visit to Fulham on the 24th February. 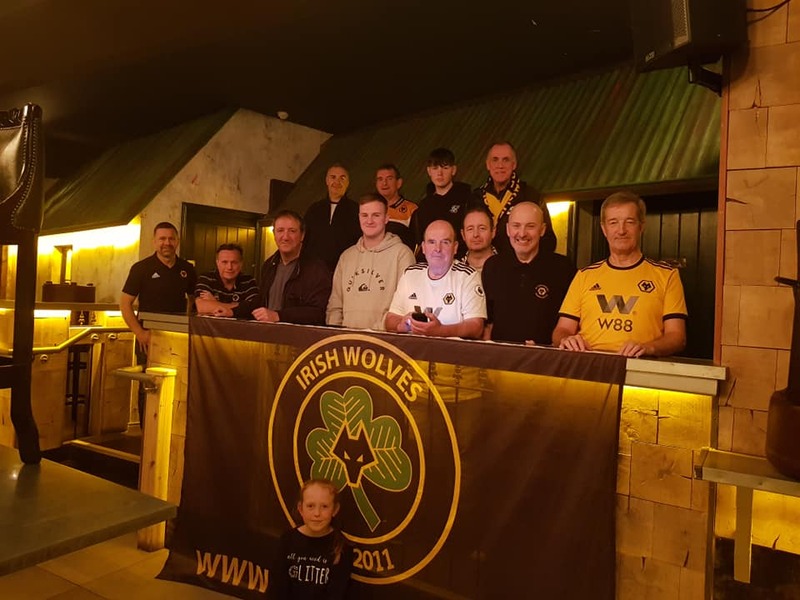 The next Irish Wolves Meeting will take place on Saturday 7th October at 1.30pm in Molly's Bar in Ballaghadereen, Co. Roscommon. Members and non-members welcome. This years AGM took place in Nancy Hands pub, Parkgate Street, Dublin on Saturday 12th August. Although the turnout was less than previous years a lively discussion took place ahead of what is anticipated to be a great season. 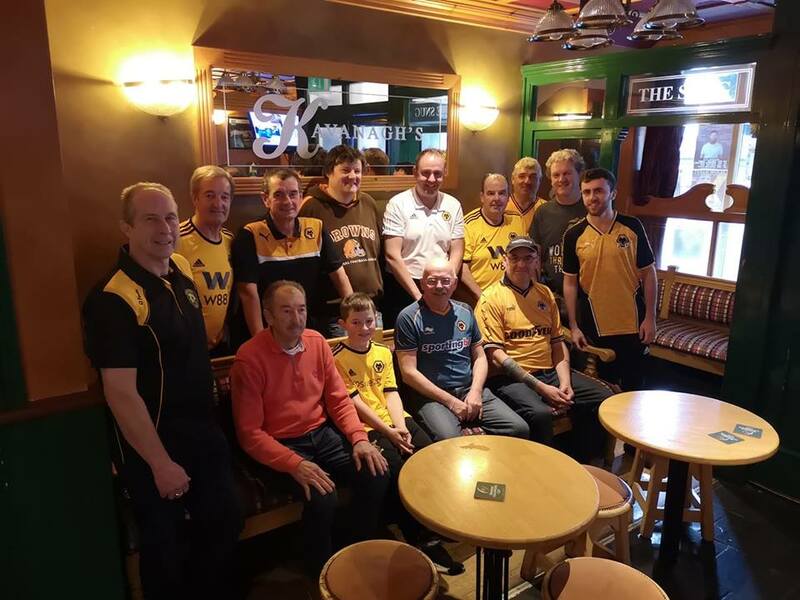 We had a good turnout at the meeting of Irish Wolves Supporters Club in Nancy Hands pub, Parkgate Street, Dublin on Saturday 8th October at 12.30pm. we even had a few lads over from Wolverhampton. Well done guys. We are holding our AGM in the Evergreen Lounge Bar in Evergreen Street, Cork at 5pm on Monday next, 18th July prior to the game against Cork City. The pub is a short walk from Turner's Cross. All members and non-members are welcome. Wolves have announced that their pre-season training will take place in Fota Island, Cork from 17th to 22nd July. A friendly game against Cork City will take place on Monday 18th July. 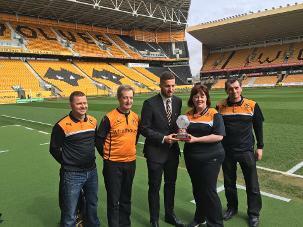 We had a great day last Saturday at Molineux. 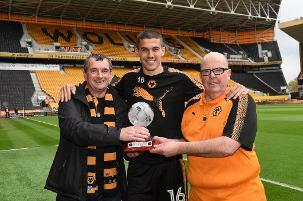 Our Player of the Season was presented to Matt Doherty before the game (see picture on left). For more pictures of the presentation go to our Gallery Section. Our next general meeting will take place on Saturday 5th March in Albert Lynch's Bar in Mallow, Co. Cork. Meeting starts at 1pm. Our Annual trip this season will take place on 2nd April and we will take in the Ipswich home game. If you are interested in travelling contact Tony. We will arrange match tickets, each member should arrange their own travel and accommodation. We would like to wish all our members and friends a very Happy Christmas and a Prosperous New Year. We had a great meeting in Nancy Hands. Several members agreed to attend the Notts Forest game in December. We had a fantastic night in Wolverhampton despite the result. The next Supporters Club meeting is on Saturday 10th October at noon in Nancy Hands pub. All members and non-members welcome. Our AGM will take place on Saturday next, 22nd August in Nancy Hands Bar and Restaurant, Parkgate St., Dublin starting at Noon. The venue is located near Heuston Station and the Phoenix Park. All members and non-members welcome to attend.